Juvenile specimens of this palm are as attractive as the mature plants. Livistona chinensis var. subglobosa is a dwarf variety. Suitable for outdoor and indoor use and is commonly used in shopping malls on the East coast. Has large light green leaves are deeply divided with about 75 segments that droop downward to give a gracefully fountain-like aspect. 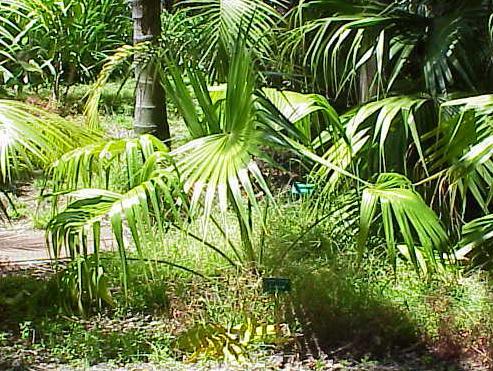 The palmate fronds get as big as 5 feet in diameter and form a dense canopy. The trunks on this variety are thicker than most Livistonas growing up to about 18 inches in diameter and even wider at the base of the tree. Can grow to 50 feet tall in habitat but, is typically 20 to 25 feet tall in the USA. This is a common palm, but may require special order it at a nursery. The Chinese fan palm is native to southern Japan, Taiwan and several islands in the South China Sea. Flowers are borne on 6 foot inflorescences hidden within the crown. This palm is ideally suited for landscapes in California, Florida, and other temperate climates. Chinese fan palm grows in almost any soil. Juvenile plants will look better when grown in part shade. This palm forms a long tap root and can survive extended periods of drought. Adequate moisture will be rewarded with rapid growth. They can survive temperatures as low as 15 degrees for short periods which might burn the leaves but they will recover and flourish. They also seem resistant to the fungus diseases that attacked other "semi-hardy" palms after being cold damaged. Small specimens look great in pots and planters. This is a good palm for small yards and makes a great potted specimen. Young palms also work well as under-story plants.